Situated only 20 miles / 32 km south of the border with North Carolina, Myrtle Beach is known as the seaside golf capital of the world. Myrtle Beach stretches along the South Carolina coast for 60 miles / 96 km and boasts beautiful sandy beaches and many interesting districts, attracting thousands of visitors each year. Commonly referred to as the 'Grand Strand', the Myrtle Beach area encompasses seven main districts, some of which lie directly on the coast, while others are set inland. The seat of government for Horry County, Conway is situated 11 miles / 18 km inland from the Atlantic coast and has good road connections with Myrtle Beach. Conway is a tree-lined district with tourist appeal and visitors are attracted by its good selection of shops and restaurants as well as a number of historic landmarks and the Horry County Museum. Recent years have seen this district develop into something of a business hub and the area makes a cheaper alternative to staying at Myrtle Beach during the peak summer season. Little River is often the first place people arrive at when traveling to Myrtle Beach. 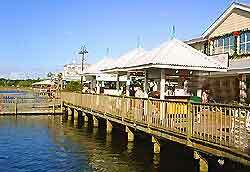 This pleasant suburb offers greenery and flowers in addition to a fantastic stretch of ocean. With an appeal that attracts an older crowd, Myrtle Beach's Little River district isn't devoid of activity, with golf courses, restaurants and cafés all enjoying an easygoing atmosphere. 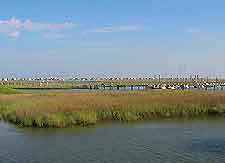 Situated to the south of Myrtle Beach is the fishing port of Murells Inlet, known for its abundance of delicious seafood restaurants. Nearby Pawleys Island is a quiet resort with a relaxed atmosphere and a history built upon its past as a popular getaway spot for plantation owners. 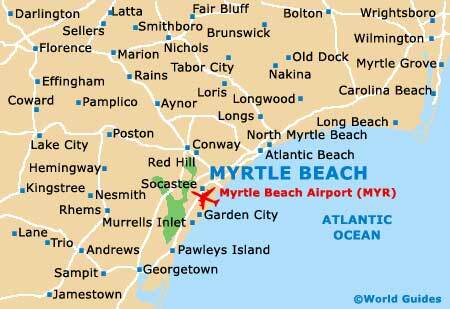 This central Myrtle Beach area lies right on the Atlantic Coast and offers miles of sandy beach. The beach has been a popular tourist destination for more than 100 years and over this time it developed from a small settlement into a town before later receiving city status in 1957. The coast is sprawling with high-rise hotels, eateries and entertainment and it is the most popular stretch of beach in the area for tourists to stay at. Boasting the widest stretch of beach, the North Myrtle Beach district was formed through the amalgamation of four smaller districts more than 30 years ago and is hugely popular among holiday makers for its abundance of places to stay and its entertainment and shopping at Barefoot Landing. With a population of over 10,000, the district is famous for being the place where the dance known as 'the shag' originated. 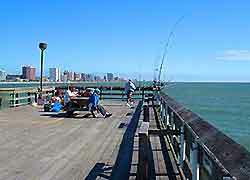 Visitors to North Myrtle Beach will find accommodation ranging from five-star hotels to motels, guesthouses, caravan sites and beach huts, while many tourists also enjoy the fishing available here at Cherry Grove Fishing Pier. Surfside Beach is a lively resort with an abundance of entertainment in the form of nearby amusement and water parks. This popular district of Myrtle Beach thrives from the tourism industry and offers an exclusive golf course, beachside restaurants and cafés, as well as good accommodation options. This stretch of beach contains a small population of around 4,000 people.